PARADISE LOST Soldiers take the hill. After making critical waves in the 1970s with Badlands and Days of Heaven, reclusive director Terrence Malick vanished for 20 years, making some fans wonder whether those two early masterpieces had been illusions. 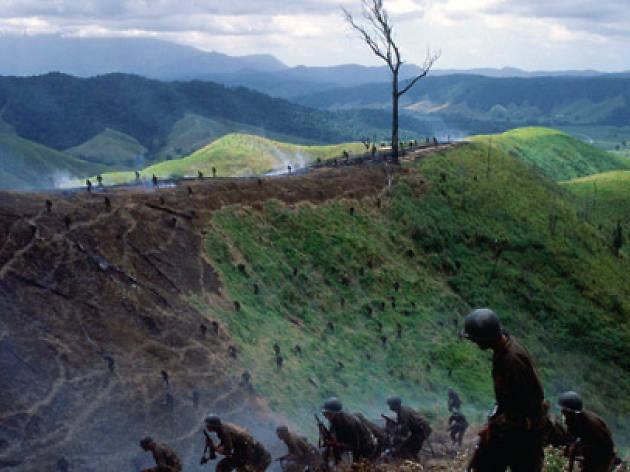 When he announced his return to filmmaking with an adaptation of James Jones's 1962 novel about the battle for Guadalcanal, some wondered if a guy who hadn't directed in so long could pull off such a complicated, ambitious studio project. There was no need to worry. Malick proceeded to use Hollywood's money and a huge cast to make a cinematic poem about how war reveals the compassion and violence within nature itself. Breathtaking shots of grass, trees and birds compete with equally stunning vistas of men lunging into the slaughter of combat. Wall-to-wall voiceovers ruminate about evil and love while the onscreen actors play out variations on the same. It's another masterpiece, but a maddeningly particular one: The ethereal, transcendentalist nature of Malick's style turned off many, while inspiring cultlike devotion in others. I'd give this pretentious idiocy zero stars if I could. It's a collection of hoary old war movie cliches, made comically incomprehensible by the most over-the-top art house cinematography possible. An utterly wretched bore of a movie.